The village of Adams, located south of Watertown was named for President John Adams. In 2010 the population of the village was 1,776 and the population for the town was 5,143. 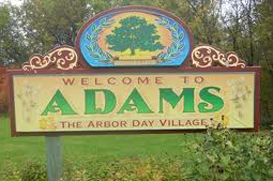 Adams is known as the Arbor Day Village because J. Sterling Morton, the founder of Arbor Day lived in Adams. Adams is located at exit 41 Interstate 81 making for an easy commute to Watertown, Fort Drum and Syracuse. If you are a history buff or love researching genealogy, check out the Historical Association of South Jefferson and take a tour of the 25 room Ripley House. Some events to check out are the Strawberry Festival, Fall Festival, Arbor Day Celebrations and Pioneer Days. If you love to be outdoors plan to visit Gould Corners State Forest and Southwick’s Beach State Park where you can camp, swim and enjoy a glorious summer day frolicking on the sandy beach. Another amazing place to visit is Lakeview Wildlife Management area which has been declared the Lakeview Marsh and Barrier Beach National Natural Landmark. Kripalu Center for Yoga and Health is located in Adams, this is a nonprofit agency dedicated to promote the integration of body, mind and spirit. At Kripalu you can walk the nature trail and the labyrinth. There is a stone circle and they are a geocache site. If you are in the mood for a new or used car, Adams is also home to Fucillo Chevrolet Buick. As their commercial says, it’s HUGE! If you are in the mood for a great meal check out Café Mira or Lucia’s Italian Restaurant. Maynard Wilson Elementary School, Clark Middle School and South Jefferson High School make up the South Jefferson School District. If you are looking to purchase a home you will have a wide variety of homes to choose from. Here you can find elegant Victorian Homes, charming farmhouses, cute and cozy ranch homes and spacious newly constructed homes. To see homes for sale in Adams click on our local real estate guide or try our power search.